Tirupattur in Collaboration with IVDP, Krishnagiri. Tragedy struck in the wee hours of Friday, November 16. Coastal and delta districts in Tamil Nadu were witness to the devastation of Gaja, a severe cyclonic storm, that left in its wake, a trail of destruction across Cuddalore, Nagapattinam, Ramanathapuram, Thiruvarur, Thanjavur, Trichy, Pudukkottai, Dindigul and Puducherry. A week after the tragedy, villages and hamlets that were worst-hit by the cyclone, were found to be still picking up the pieces. It is in this juncture Sacred Heart College (Autonomous), Tirupattur, responded with a novel initiative in reaching the unreached and worst hit regions. As a result of this natural catastrophe (Gaja Cyclone), many families have been suffering from black outs (total power failure) for many days and some weeks. While there are many NGO’s and Corporate institutions aiding in the disbursement of food, clothing and other materials, Sacred Heart College felt the immediate need in providing basic lighting facilities to such cyclone struck families. With the able guidance of Rev. Dr. C. Antony Raj, the Rector/Secretary of the college along with Rev. Dr. D. Maria Antony Raj, the Principal, a team of two Faculty members, viz., Dr. S. Paul Raj, HoD of Social Work and Rev. Fr. Henry Daniel Ambrose, Director, Extension Services along with four student representatives viz., Sr. Jeeva, Ms. Raj Praveena, Mr. Arun Kumar and Mr. Sudhkar visited ‘Thoppu Kollai’ in Pudukottai on 27th November 2018 and executed the operation. The team was able to see the mass damage caused by the Gaja Cyclone to the houses of the victims. One cannot assure the timeline for these victims to get back to normalcy. Proving its love for mankind and in keeping with the vision and mission of St. Don Bosco, Sacred Heart College as part of its ISR (Institutional Social Responsibility) along with help of the Salesian Community of Don Bosco Youth Village, Keeranur, reached out in lending a helping hand to this cyclone hit district. This initiative saw the noble contribution of Rs. 5,00,000/- by the students and with equally met contributions by the IVDP (Integrated Village Development Project) of Krishnagiri. Thanks to Mr. Kulandai Francis, the Founder –Director, IVDP, Krishnagiri and to D’Light for their gesture in providing the articles in a discounted price. This humane endeavor resulted in a total of Rs. 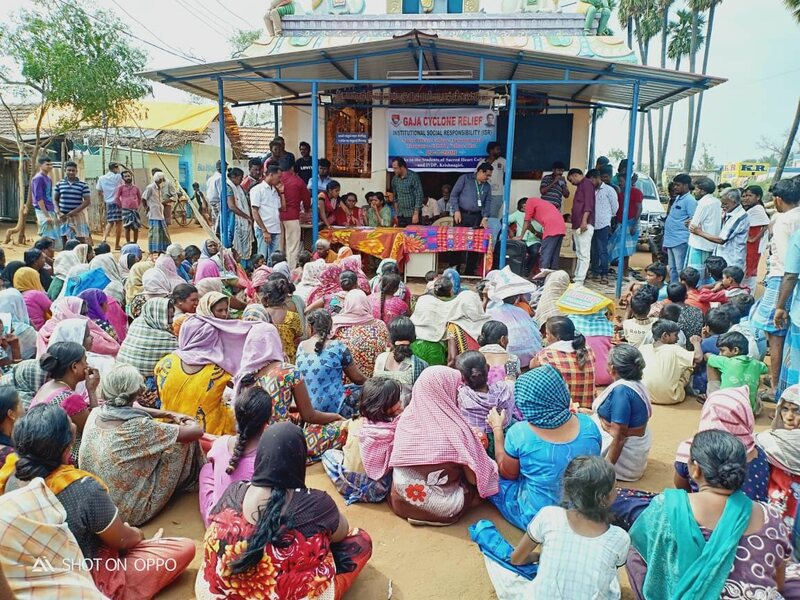 14, 25,000/- worth of a solar-powered lamps being distributed to the people of Sri Lankan Refugee Camp at Thoppu Kollai, and people of Palandampatti near Pudukottai. Rev. Fr. Barnabos, SDB helped us in mobilizing the community for the smooth conduct of the distribution process. Dr.S.Paul Raj gave a brief introduction about the initiative of Sacred Heart College, Tirupattur and IVDP Krishnagiri. 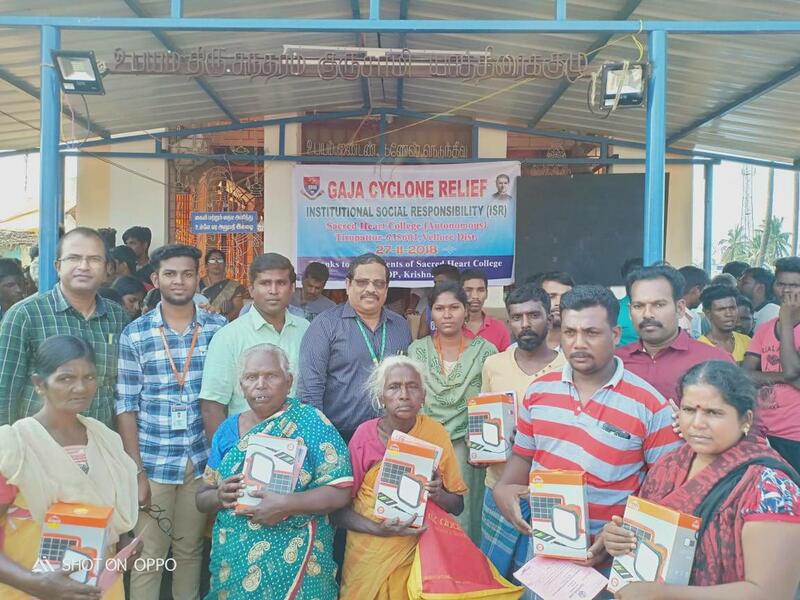 After a careful scrutiny of the beneficiaries’ family card by the student volunteers, Dr.S.Paul Raj and Fr.Henry Daniel Ambrose distributed the Solar Lamps to the beneficiaries. The student volunteers too helped in the distribution of relief materials to the people. A total of 528 people benefited from this kind hearted gesture. Mr. Niyas, an Employee of D’Light, the manufacturer of solar lamps was also present to give a product demonstration on the usage of the solar powered lamps to the beneficiaries. 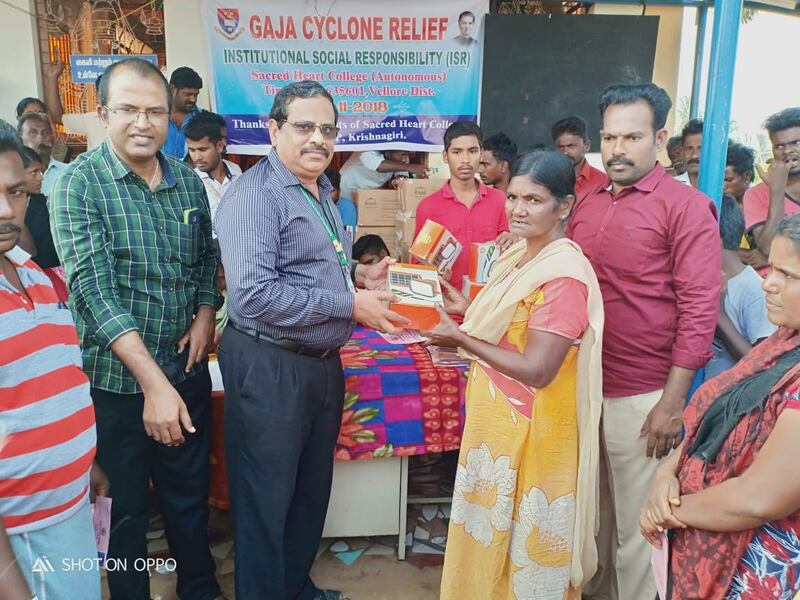 Darkness cannot drive out darkness: only light can do that, and Sacred Heart College facilitated such a light to the victims of the Gaja Cyclone in Thoppu Kollai and Palandampatti near Pudukottai . The people were very happy to get the benefit of a solar lamps which they said would be very useful for them and for their children. They thanked each and every one of the students of Sacred Heart College (Autonomous) Tirupattur, and IVDP, Krishnagiri who contributed for their welfare. They also expressed their gratitude to the Management of Sacred Heart College and the Director of IVDP for the timely gesture.